Yep, a little behind on my reading. I just saw this kitchen in the Spring 2012 issue of my NKBA Magazine (I know, way behind on my reading) and had to share it. We all know that all things neon are HOT right now but how about in 15-20 years, the average length of time that people keep a kitchen before they decide to change or remodel it? Now, don't get me wrong. 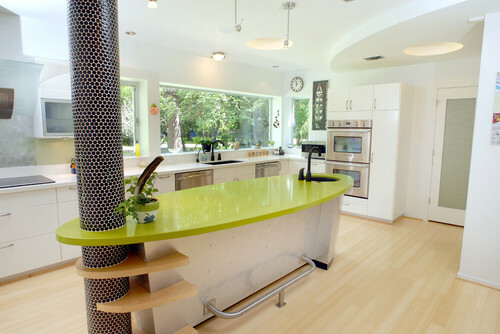 This kitchen is RAD, it's AWESOME and as a designer I would love to have a client that would come to me and say "I want neon green cabinets, neon pink countertops and you know what, let's just go all out and add a little neon orange too." But my innate sensibility says to me, maybe something a little more understated with a POP of neon would be a better investment. Either way, I think this neon trend has just begun. I predict that we will be seeing a lot of the pinks and greens through the end of the year and I even have a feeling that the neon blue's and purple's will find their way into fashion and home decor early next year. What do you think about the neon trend? I LOVE the neon trend....although I have to admit, this kitchen might be a little much for me ;) Like you said, maybe something like this, but with a different spin.